We have already explained in detail about the basics of regulated power supply,Â voltage regulators and IC voltage regulators. 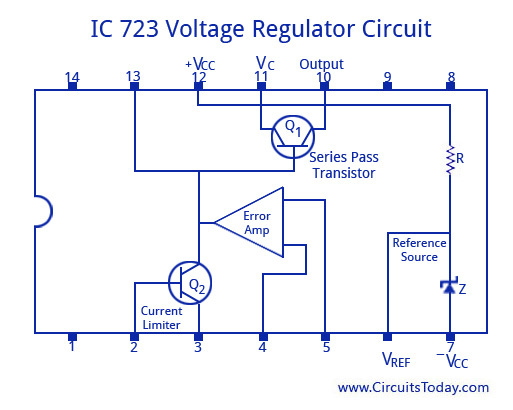 Let us take a look at one of the most popular IC voltage regulators, the 723 Voltage Regulator IC. The functional diagram of the voltage regulator is shown below. It consists of a voltage reference source (Pin 6), an error amplifier with its inverting input on pin 4 and non-inverting input on pin 5, a series pass transistor (pins 10 and 11), and a current limiting transistor on pins 2 and 3. The device can be set to work as both posistive and negaive voltage regulators with an output voltage ranging from 2 V to 37 V, and output current levels upto 150 m A. The maximum supply voltage is 40 V, and the line and load regulations are each specified as 0.01%. voltage regulators, the 723 Voltage Regulator IC. The functional diagram of the voltage regulator is shown below. It consists of a voltage reference source (Pin 6), an error amplifier with its inverting input on pin 4 and non-inverting input on pin 5, a series pass transistor (pins 10 and 11), and a current limiting transistor on pins 2 and 3. The device can be set to work as both posistive and negaive voltage regulators with an output voltage ranging from 2 V to 37 V, and output current levels upto 150 m A. The maximum supply voltage is 40 V, and the line and load regulations are each specified as 0.01%. 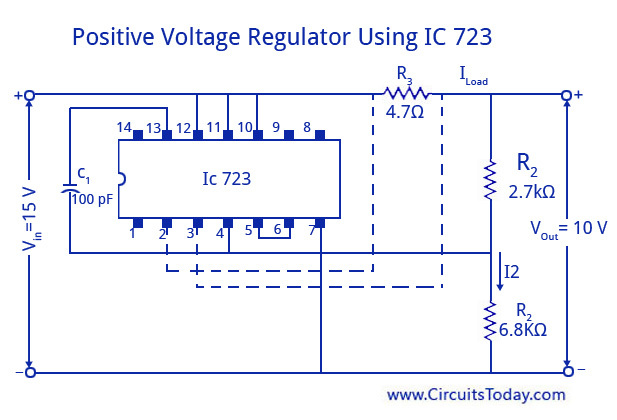 The figure shown below is a positive voltage regulator with an IC 723. The output voltage can be set to any desired positive voltage between (7-37) volts. 7 volts is the reference starting voltage. All these variations are brought with the change of values in resistors R1 and R2 with the help of a potentiometer. A darlington connection is made by the transistor to Q1 to handle large load current. The broken lines in the image indicate the internal connections for current limiting. Even foldback current limiting is possible in this IC. A regulator output voltage less than the 7 V reference level can be obtained by using a voltage divider across the reference source. The potentially divided reference voltage is then connected to terminal 5. Another importat point to note about this IC is that the supply voltage at the lowest point on the ripple waveform, should be at least 3 V greater than the output of the regulator and greater than Vref. If it is not so a high-amplitude output ripple is possible to occur. jawapan nie ada kaitan tak dengan topik DC REGULATED POWER SUPPLY USING IC UA723? harap dapat bagi feedback secepat mungkin 🙂 terimakasih. Hi Elango use the following circuit which will convert +12 to -12 volt for low current application. i think it will get by changing the polarities. i have +12vdc. but i want -12vdc supply how to convert this supply?